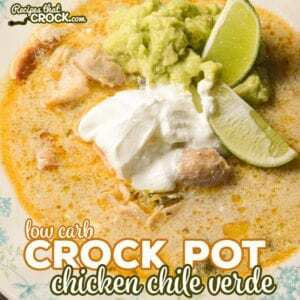 Long time readers know how much we LOVE our Crock Pot Pork Chile Verde (and the Electric Pressure Cooker Version), so it should come as no surprise that we would try to switch it up with chicken. I have been making the chicken version of this soup for months and I absolutely love how it gives the dish a bit of a different flavor. 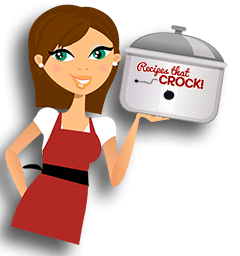 Both the pork and chicken versions are now some of my absolute favorite low carb soups! 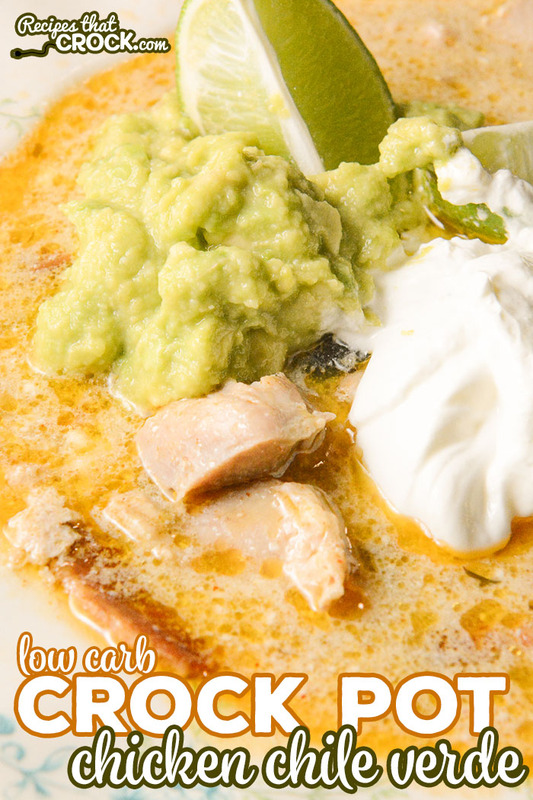 I love the smoky savory flavor combined with the cool sour cream and creamy guacamole! 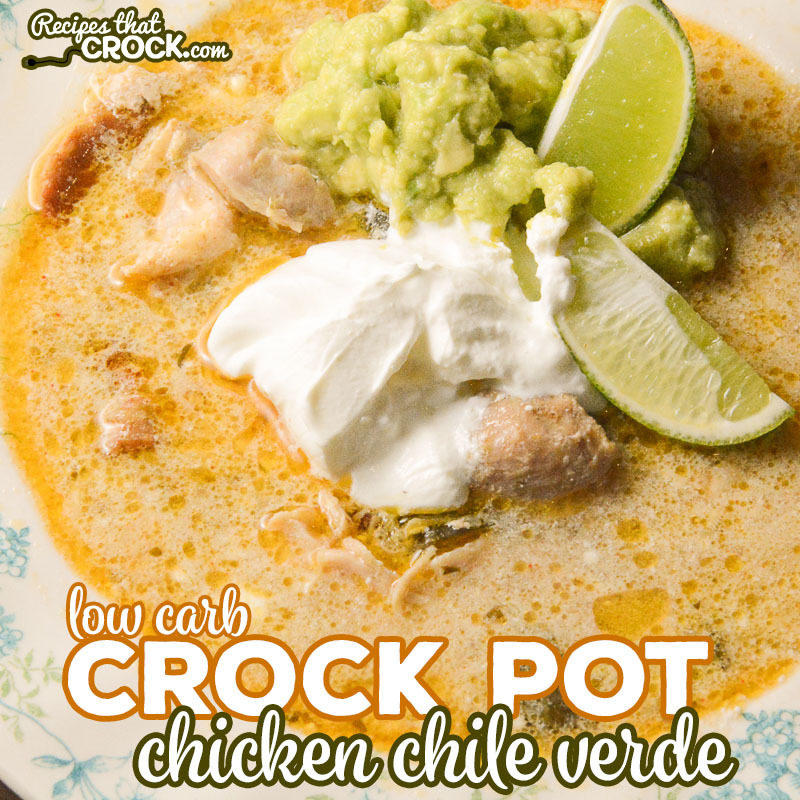 We adapted our Crock Pot Pork Chili Verde Soup (Low Carb)(inspired by a recipe found in Easy Low-Carb Slow Cooking) to make this Crock Pot Chicken Chili Verde Soup (Low Carb) Recipe. 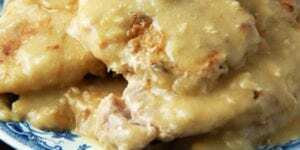 We prefer to use boneless, skinless chicken thighs in this recipe, but you can use chicken breasts if you prefer. You will just need to keep an eye on it the first time you make it to make sure you do not overcook your chicken. 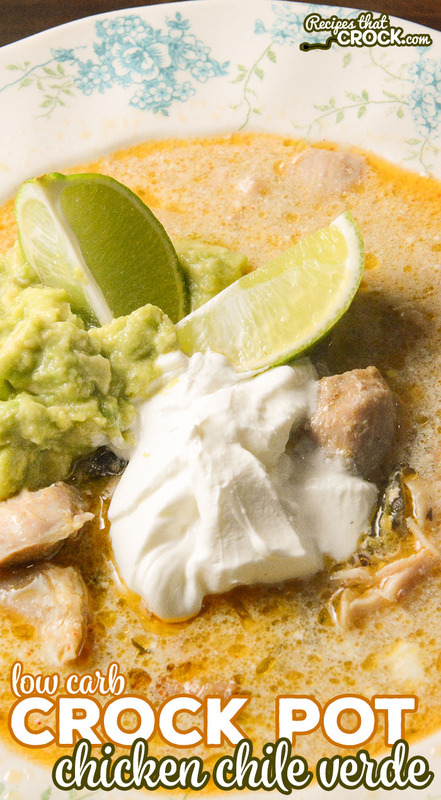 We use our favorite guacamole recipe as a garnish in this soup. 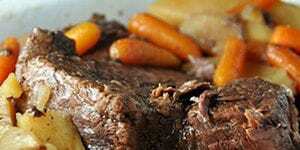 We use our Ninja Multicooker to make this recipe, however you can use any 6 quart slow cooker. Place all ingredients in a 6 quart slow cooker except sour cream and garnish. Cook on high for 3-4 hours or low for 4-6. Stir in one cup of sour cream. Serve in bowls and top with garnish. We just made this and wow it is so good. For a quick and easy Chile Verde, this is the one to consider. Give it a try and I am sure you will like it. It doesn’t have alot of real heat to it, but using the fresh peppers give it that Verde flavor you are looking for. And if you like more heat this is were you can turn up the heat. Our family really liked it. Thank you Cris for sharing! So glad you guys enjoyed it!! 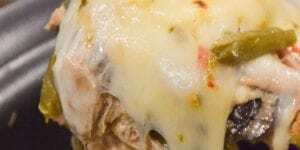 Question – you say the salsa verde is “divided.” Am I missing what to do with the other half? That was a typo. Originally we divided the salsa in the slow cooker as we layered ingredients but after making it several times we decided it made no real difference. I just forgot to take “divided” off my ingredient list. WOULD YOU PLEASE POST THE CARB COUNT ON YOU RECIPES? OR AM I MISING SOMETHING? We don’t provide nutritional information because we feel it is incredibly misleading for recipes on the internet. Nutritional information will be different for every home cook because it always will depend on the exact ingredients and products you use. 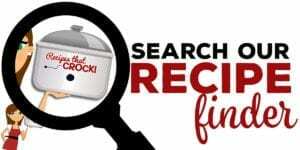 We wrote a post about it a while back and compared products to show how vastly different simply based on different brands of the same ingredients (https://www.recipesthatcrock.com/frequently-asked-questions-nutritional-information/ ). 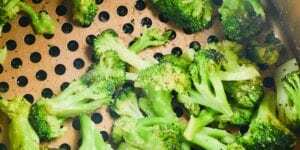 Since writing that post we began eating Low Carb in our home and readers asked we share the low carb recipes we enjoy at home. 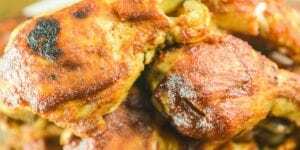 When something is marked low carb on the site it is because we make it using low carb ingredients and enjoy it as a part of our low carb lifestyle. At first I tried to share net carbs, but as I began to learn how much products varied in carb counts specifically, I began to be worried that information could be incredibly misleading so I stopped. I know that is probably not the answer you were hoping for, but after a lot of consideration we have decided to not include it at this time.